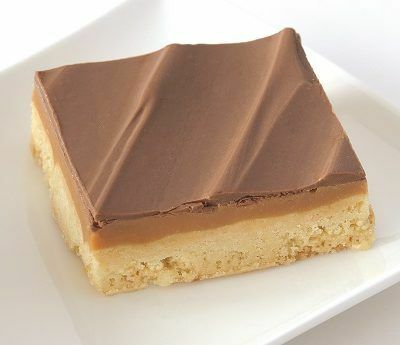 An all butter shortbread generously topped with caramel and finished with a layer of milk chocolate. Caramel (35%) (Sweetened Condensed Skimmed Milk, Glucose Syrup, Golden Syrup, Palm Oil, Butter (Milk), Sugar, Water, Emulsifier: E471; Stabiliser: E440; Salt, Flavouring), Wheat Flour (Wheat Flour, Calcium Carbonate, Iron, Niacin, Thiamin), Butter (Milk), Milk Chocolate (14%) (Sugar, Cocoa Butter, Whole Milk Powder, Cocoa Mass, Emulsifier: Soya Lecithin; Flavouring), Sugar, Brown Sugar. Made in an environment where egg, nuts, sulphur dioxide, sesame and mustard seeds are used. Supplied frozen in boxes of 16 portions and conveniently wrapped in multiples of 4, so you only need to defrost four slices at a time. 7 days shelf life from defrost when stored under a cake dome or equivalent.